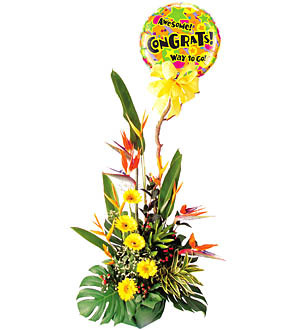 Celebrate with this one-of-a-kind tropical arrangement that just begs to be talked about. Fiesty Birds of Paradise, Gerberas and imported foil balloon 18” in a pot. Measures approx. 1.5m. Message - Congrats! Stars and Balloons. 24/7 days delivery applies for order within Klang Valley(Kuala Lumpur, Petaling Jaya, Selangor, WP) only. For outstation delivery within Malaysia, deliveries are for working days only and is subject to a mimimum price depending on the location. Same day delivery applicable for order made before 12pm on the day. For customization, contact Pods & Petals Giftlab at +603-78830233 / +6012-6915200 or sales@gift-lab.com for enquiries.